Use your time more wisely! Start smart social monitoring immediately. Approximately 46% of online users count on social media when making a purchase decision (Source: Nielsen), and 72% of people who complain on Twitter expect a response within an hour (Source: HubSpot). Social media provides an excellent opportunity for you to reach out to potential customers, but should you be expected to monitor around the clock? Which networks should you pay attention to? Where do you even start? 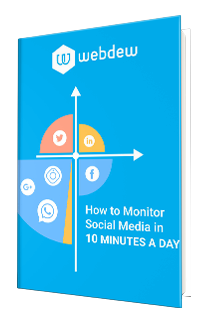 In this ebook, How to Monitor Social Media in 10 Minutes a Day, we'll answer these questions and teach you how to streamline your social media monitoring process. Work smarter, not harder, and save more time. It's so easy to start. You could begin today! © Copyright 2018 Webdew | All Rights Reserved.